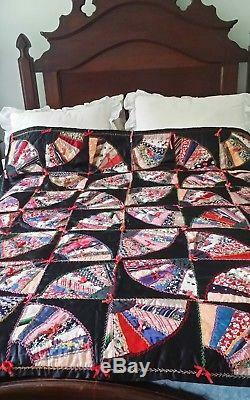 VIBRANT Vintage Fans Crazy Antique Quilt ELEGANT fans tied is hand pieced, hand embroidered accents, and nice black border. It measures 60" X 70" and is in perfect condition. The back and hand stitched binding fabric used in the border, and the batting, is thin. The WONDERFUL COLORS and GREAT DESIGN make this early 20th century beauty stand out -- it would make a terrific wall hanging! 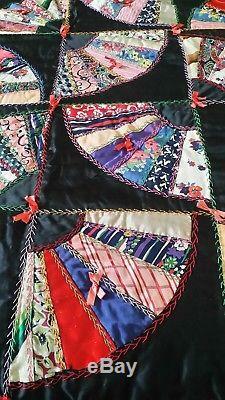 The item "VIBRANT Vintage Fans Crazy Antique Quilt Hand Made embroidered tied hand sewed" is in sale since Sunday, September 16, 2018. 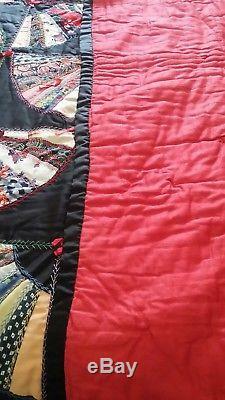 This item is in the category "Antiques\Linens & Textiles (Pre-1930)\Quilts\Completed Quilts". 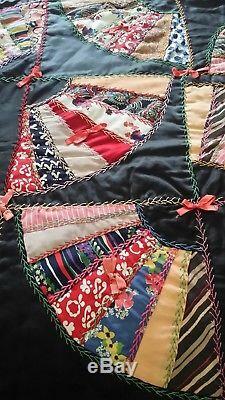 The seller is "grannyspackrat" and is located in Mendon, Michigan.